At Oasis Massage and Spa in Omaha, Ne., our goal is simple: provide a peaceful, relaxing haven for our clients. The focus is you. Melt away stress, soothe your senses, or give your beauty a little boost with one of our relaxing and revitalizing services. From renewing facials and indulgent body treatments to pampering nail and waxing services. 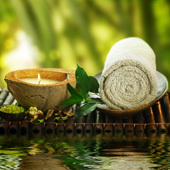 Oasis Massage and Spa offers therapeutic massage aimed at enhancing your overall wellness. Whether you have a specific area of muscle pain or just need some relaxation and attention, Oasis offers the best massage therapists in Omaha. If you’d like to escape for a few hours, step into Oasis and leave the world behind. We’ll provide a peaceful, relaxing haven for you, where you leave all the stress and worries of life outside our door. Give the gift of relaxation to your loved ones. Purchase a gift certificates online to be emailed or printed. Whether you need pain management, stress reduction or pure relaxation, Oasis is the place for you. We truly believe in the well-being of our clients, and our therapeutic massages and facials are customized to meet our clients' individual needs. We offer a variety of massage and spa services. Enjoy a relaxing massage, rejuvenating facial, soothing body treatment, or combine therapies for a luxurious spa day. Oasis opened in 2004 and has been providing a place of rest and refuge for a growing clientele ever since. We’re here because we want to help improve our clients’ quality of life. From helping to alleviate chronic pain to a relaxing spa treatment, we truly believe in the well-being of our clients. Our therapeutic massages and facials are customized to meet our clients’ individual needs. Our massage therapists and estheticians will treat you with outstanding quality and service. Conveniently located at 132nd and Dodge, in the Linden Market, we love being at a central location for the Omaha metro. We have worked hard to create a comfortable atmosphere for every guest to feel pampered inside our environment that is peaceful, relaxing, and sophisticated. Come let our highly trained professionals care for you!